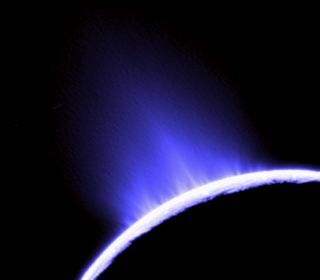 SAN FRANCISCO — Scientists are developing a mission concept that would snag icy particles from Saturn's moon Enceladus and return them to Earth, where they could be analyzed for signs of life. The spacecraft would fly through the icy plume blasted into space by geysers near Enceladus' south pole, then send the collected particles back to our planet in a return capsule. Enceladus may be capable of supporting life, and the flyby sample-return mission would bring pieces from its depths to Earth at a reasonable price, researchers said. "This is really the low-hanging fruit" of sample-return missions, said study leader Peter Tsou of Sample Exploration Systems in La Canada, Calif., who presented the idea here Wednesday (Dec. 5) at the annual fall meeting of the American Geophysical Union. "It would be a shame not to pick it." Life as we know it requires four things, Tsou said: liquid water, carbon, nitrogen and an energy source. All four are present at Enceladus, and as a result many researchers regard it as one of the solar system's best bets to host life as we know it. Enceladus generates huge amounts of heat internally, with much of it perhaps being produced by tidal interactions with Dione, another Saturn satellite. This heat powers the geysers from Enceladus' south pole, which eject water ice, carbon-containing organic compounds and other materials from the moon's subsurface into space. The proposed spacecraft would enter into Saturn orbit to slow down and enable possible multiple passes by Enceladus. It would then fly through the moon's icy plume, collecting geyser particles in a cushioning aerogel. A small return capsule would deliver the samples to Earth, where scientists could search them for amino acids and other possible biomolecules. Sample-return is the preferred strategy when it comes to hunting for signs of life on other worlds, Tsou said. An automated probe in the depths of space would have a bare-bones analytical toolset, and it could perform only a limited number of experiments for a relatively short time. But here on Earth, researchers in fully equipped labs all over the world could conduct numerous experiments and potentially corroborate big discoveries claimed by other groups. "You need very precise, repeated measurements," Tsou told SPACE.com. No big technological advances are necessary to make the mission happen, Tsou said. In fact, something similar has already been done. NASA's Stardust mission — which Tsou served as deputy principal investigator for — collected particles from Comet Wild 2 and successfully returned them to Earth in 2006. "Technology-wise, Stardust proved that this can be done," Tsou said. But Tsou and his colleagues have pared the potential mission down, making the spacecraft — which would be roughly 16 feet high and 10 feet wide (5 meters by 3 meters) — leaner and more focused. As currently envisioned, the probe's science gear would consist of an aerogel collector, a tool for trapping volatile chemicals, a mass spectrometer, a navigation camera and a dust counter (so mission scientists could confirm that they'd flown through the plume). For power, the spacecraft would rely on an advanced stirling radioisotope generator (ASRG), which converts the heat produced by radioactive decay of plutonium-238 into electricity. Tsou said that the ASRG is much more efficient at this conversion than radioisotope thermoelectric generators (RTGs), which have powered space probes for decades. Tsou said the team wants Enceladus sample-return to fly as a NASA Discovery mission, meaning it would be capped at $425 million in 2010 dollars, not including the launch vehicle. The researchers hope to propose the mission at the next Discovery opportunity, which may come in 2015 or so, Tsou said. If the mission is approved, it could probably be ready to launch by 2020, Tsou added. Samples from Enceladus' plume would make it to Earth about 14 years later. Enceladus is a great candidate for sample-return, Tsou said. Its geyser-blasted particles are fresh, having come right out of the moon's subsurface ocean. The mission can be done without landing on and re-launching from another world, two costly and complicating extra steps. And Enceladus seems to have all the ingredients necessary to support life. "That doesn't mean life is there," Tsou said. "But we want to find out."